What: Bike ride from San Francisco across the Golden Gate Bridge to Sausalito and ferry return. This is a moderate ride. There is only one climb and one descent. Otherwise it's a "cruise." We'll meet at 2715 Hyde Street near Fisherman's Wharf to pick up the bikes. We'll ride to the Palacio de Fine Arts for a Chinatown Dim Sum Bakery picnic. 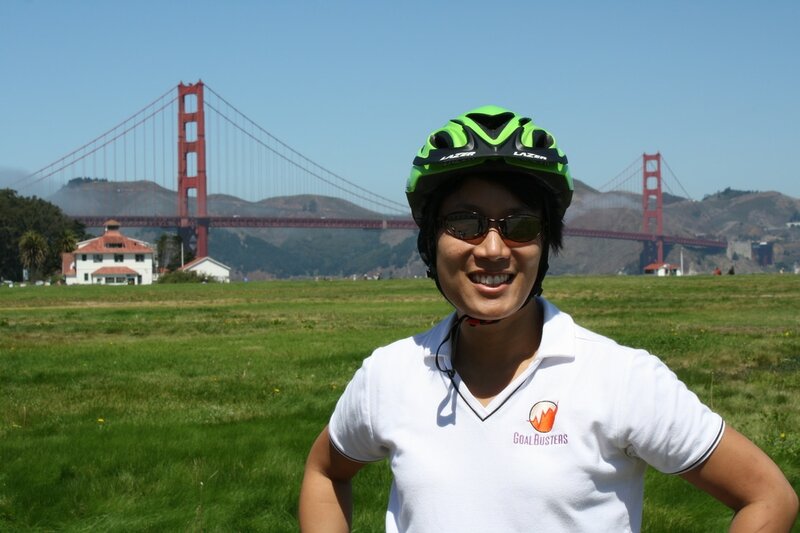 Then we ride across the Golden Gate Bridge to Sausalito with lots of photo opportunities. In Sausalito we'll have food and drinks with a view before catching the ferry for an Alcatraz "drive by" on our way back to Pier 41. Time: 11 am - 6 pm departure from 2715 Hyde Street. Booze add-on: If you change your mind or need to split it for expense purposes, $25.00 per person. You can pay in advance below or reserve your spot and pay at the day of the bike ride. If you need to make other payment arrangements, please contact Alice at jim.anderson@goalbusters.net. We will also accept payment by credit card, check or cash (US Dollars, sorry) onsite, if needed.